I was perusing a blog that I look at occasionally and they had taken pictures of real frozen dinners, with the boxes. This looks nothing like the picture on the box, and truly looks inedible. Although most of those ingredients are recognizable, you generally wonder…. just what is Thiamin Hydrochloride? But why not know all the ingredients? Why not make it yourself? Why does our culture rely so much on convenience and cost over good for our bodies and peace of mind? We all work with people that pop these in the community microwave and mindlessly ingest them, maybe we are one of them. We all are short on time, or short on money. But what are we willing to sacrifice? Our health seems like a dangerous tradeoff. I have the ability to make a batch of 30 fantastic meatballs that I personally know what the ingredients are and where they came from, all for less than 10 dollars. Check it folks, that is 33 cents a meatball, in addition you get the added bonus of not having to make two extra meals because you would have left-overs. 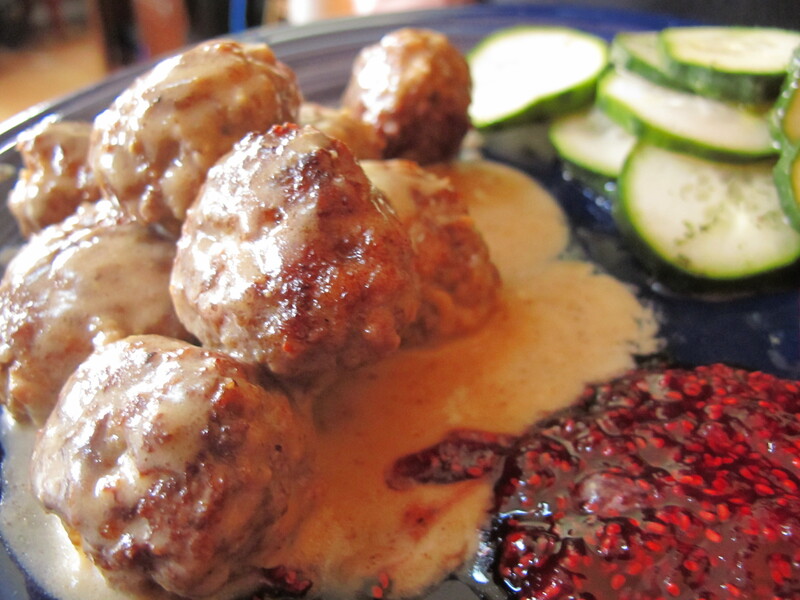 (Although be forewarned the recipe below is extremely addictive and doesn’t last long in our house) In the picture above there are 5 meatballs…. that is $1.65 and it is mostly noodles, which automatically turns into body fat for those of us with PCOS. That just doesn’t seem right to me. I encourage you to take more care, take joy in creating the food that will nourish you, know all of your ingredients. Can be served with egg noodles or mashed potatoes, but who needs em? For the Meatballs: Whisk egg and cream together in medium bowl. Stir in panko and set aside. Meanwhile, in stand mixer fitted with paddle attachment, beat pork, onion, nutmeg, allspice, pepper, brown sugar, salt, and baking powder on high speed until smooth and pale, about 2 minutes, scraping bowl as necessary. Using fork, mash panko mixture until no large dry panko remains; add mixture to mixer bowl and beat on high speed until smooth and homogeneous, about 1 minute, scraping bowl as necessary. Add beef and mix on medium-low speed until just incorporated, about 30 seconds, scraping bowl as necessary. Using moistened hands, form generous tablespoon of meat mixture into 1-inch round meatball; repeat with remaining mixture to form 25 to 30 meatballs. For the Sauce: Pour off and discard oil in pan, leaving any fond (browned bits) behind. Return pan to medium-high heat and add butter. When foaming subsides, add flour and cook, whisking constantly, until flour is light brown, about 30 seconds. Slowly whisk in broth, scraping pan bottom to loosen browned bits. Add brown sugar and bring to simmer. Reduce heat to medium and cook until sauce is reduced to about 1 cup, about 5 minutes. Stir in cream and return to simmer.